Jaguar has unveiled its new - and slightly smaller SUV - the E-Pace. The 2018 model is available to order now, with prices starting at £28,500. Jaguar claims that the E-Pace will become its biggest-selling model when it goes on sale next year. It will join the larger F-Pace and all-electric I-Pace in the Jaguar line-up. However, the E-Pace will be the cheapest of the trio, with prices starting under £30,000. 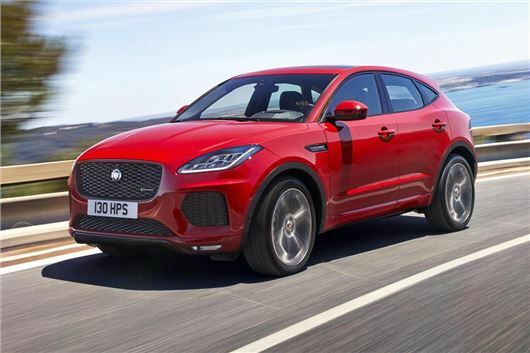 The E-Pace will be offered with the choice of five 2.0-litre engines, which will span three diesels and two petrols. It will also come with two-wheel as well as four-wheel drive, with the former expected to make up the majority of orders. Jaguar claims that the entry-level 150PS diesel will return 60.1mpg and 124g/km of CO2. At the opposite end end of scale, there will be a high-performance 240PS diesel with 500Nm of torque and a 0-62mph time of seven seconds. There are no official fuel economy figures for this - or any of the other engines - although CO2 emissions will be 162g/km. The 180PS diesel with four-wheel drive will cover 0-62mph in under 10 seconds and emit 147g/km of CO2. Four-cylinder petrol engines will be available with 249PS or 300PS producing 365Nm and 400Nm of torque respectively. Both are available with all-wheel drive only. The 249PS model completes the 0-62mph sprint in seven seconds while the top 300PS version will achieve it in 6.4 seconds. Gearbox options will vary from six-speed manuals to nine-speed autos, depending on which engine and output you choose. The five-seater SUV will boast 577 litres of boot capacity, while the 60/40 split folding rear seats will provide 1234 litres of space. According to Jaguar, with one side folded down, a driver can carry items up to 1.6 metres long and still accommodate two passengers in the back. At 4.4 metres long, the E-Pace will be one of the shortest SUVs in its class, but Jaguar is promising space for five adults inside, while the in-car 4G wifi will allow up to eight devices to download online content. A 10-inch colour touchscreen will be home to Jaguar's latest Touch Pro infotainment system, with smartphone commands, such as pinch and swipe to zoom in or change screen displays. The traditional instrument binnacle is replaced by a 12.3-inch TFT screen, which will allow the driver to customise the view with navigation directions and speed limits. There will be three trim levels to choose from - S, SE and HSE - plus an R-Dynamic model with a sports bodykit and unique bumpers with larger air intakes. The E-Pace will get Jaguar's latest active safety kit that will enable to E-Pace to automatically stop in the city or warn the driver of approaching traffic when pulling out of a tight junction with limited visibility. Jaguar says its UK factories are close to capacity so it has struck up a partnership with engineering and manufacturing specialist Magna Steyr in Graz, Austria to build the E-Pace. What do you know about the quality of Magna Steyr . Are they up to JLR build quality ? The shape doesn't say Jaguar to me but maybe it needs getting used to! Like this one but how come I have a top of the range auto GTLine Kia Sportage with all the bells and whistles for 26K, seven years proper warranty and very reasonable service costs, £365 for 3 years service contract. As usual with Jag, BMW, Audi and VW all vastly overpriced and not half as reliable.